You say “Pioneer Day,” we say “Pie ’n’ Beer Day,” but it’s all in good pun. July 24—Pioneer Day. It’s a Utah state holiday commemorating the arrival of LDS Church prophet Brigham Young and his followers to the Salt Lake Valley in 1847. Many Utah towns host parades and family-friendly festivals to commemorate the Mormon pioneers, and the Salt Lake City parade is the biggest community event of the year. When I moved to Utah more than a dozen years ago, I was fascinated to see that my friends fell into two camps for July 24 festivities. Pioneers vs. “Pie and Beers” were divided roughly by modern religious affiliation, rather than pioneer ancestry. The former often marched in the parade with their kids’ Boy Scout troops, and the latter planned post-parade get-togethers with cold brewskis in a big cooler and delivery from The Pie pizzeria. In the spirit of congenial camaraderie, bars and restaurants across the Beehive State open their doors to both camps, or take the day off so employees can have their own day of fun. 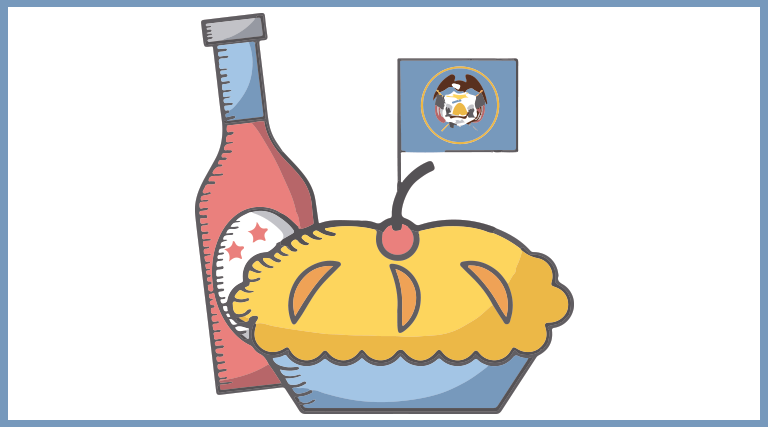 I asked some of my favorite pie and beer experts what they’d suggest for pairing up sweet or savory pies with appropriate local brews. Their suggestions are so tasty I’d recommend them the other 364 days of the year, too. Philip Grubisa—the owner, founder and lead sawbones of Beltex’ merry boucherie band—grew up in southern Florida. Come summertime, he’s particularly nostalgic for tastes of his homeland. “I had lots of neighbors from Jamaica, so I have these great flavor memories of ingredients like Scotch bonnet peppers, coconut milk and allspice,” he says. 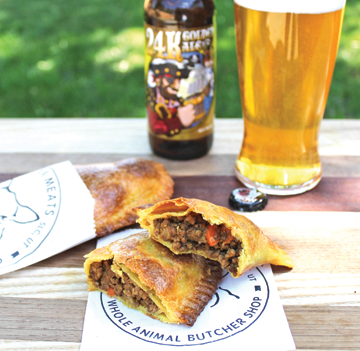 In addition to Beltex’ steady supply of nose-to-tail custom butchering, charcuterie and sausages, Grubisa and team will sometimes offer savory meat pot pies in the winter, and lighter-crusted hand pies for a great summer bite on-the-go. His Caribbean-inspired hand pie combines spiced wagyu beef with Scotch bonnet peppers, coconut milk and a touch of allspice wrapped in a savory hot lard, curry-laced dough. He recommends pairing this spicy-savory snack with local 2 Row Brewing’s 24K golden ale: “They make really good beer. The 24K’s lower ABV [at 5.7 percent] makes for easy drinking,” he says. He likes this beer’s balance from start to finish as a great pairing with spicy food. When it comes to pairing pizza pie with beer, I’ve long deferred to my friend Chad “Hoss” Forrest, a Utah native who writes the beer review blog Hoss on Hops (HossonHops/blogspot.com). 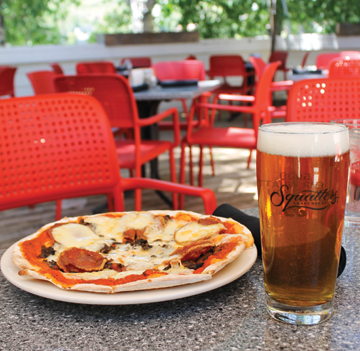 He recommends getting some piping-hot pizza and a nicely pulled draught beer at Wasatch Brew Pub in Sugar House or Squatters downtown or Park City. Personally, I like to get away from the downtown crowds, and the Squatters in Park City is a perfect people-watching perch away from Main Street mayhem. Hoss and I are both fans of the “Locals Only” pie, topped with Utah-made Creminelli calabrese salami, Mountainview mushrooms, Beehive cheese fresh mozzarella, house marinara and crust made with Big J flour. To go with this pizza, Forrest says, “Since I’m a dog lover, I would pair that with a Chasing Tail ale. I love that Golden Ale, and the citrus on [the new orange edition] is worth a try. If you want to go big or go home, hit the Hop Rising Double IPA.” Or have both. We’re not judging. Beer Bar’s annual Pie & Beer Day party has become the stuff of legends. It’s one of the best spots in town for indulging in your every brew-based fancy, and chef Brendan Kawakami usually teams up with local chefs to crank the P&B pairing level to 11. He graciously shared his recipe for the Buttermilk Pie that was a huge hit during the 2017 festivities. His secret for perfect flaky crust? Cutting very cold butter and straight-from-the-freezer vodka into the pastry. For beer pairing, Kawakami doesn’t like to lay down hard-and-fast proclamations: “My No. 1 rule for summer: Drink whatever the hell you feel like drinking, whether it’s sweet, tart or stout.” But when pushed to give suggestions, he says it’s fun to try fruity Lambics with mousse or custard pies, or a Flanders-style ale with fruit pies. 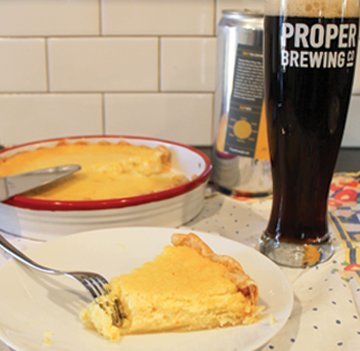 As for pairing with his original Buttermilk Pie, he’s a fan of Proper Brewing Co.’s Belgian-style table beer Brumblin’ Brown. With notes of nutty malt, brown sugar and raisin, “It’s got nice plump, round flavors,” Kawakami says, and sips well alongside this tangy and citrus-forward pie. Cut cold butter into flour with a pastry cutter, two knives or a food processor until it barely forms clumps. Add vodka right out of the freezer and cut into dough. Form a ball and rest it in a cool place for at least 30 minutes (just enough time to make the filling). Beat the eggs and goat cheese together thoroughly, then beat in the flour. Whisk in butter, buttermilk, citrus juice and zest until completely combined. Roll out pie crust dough and place in pie dish. Pour filling into the crust, and slightly jiggle to release air bubbles. Bake for 10 minutes at 425. Leaving the pie in the oven, reduce heat to 350 and bake for about another 30 minutes. “I really believe that dark chocolate goes great with stout beer, and there’s something about the Kiitos brewing process that takes all the bitter out,” Even Stevens chef Brandon Price says. He’s a big fan of Kiitos’ coconut stout, which uses organic toasted coconut and quite a bit of oatmeal in the beer mash. “The natural sweetness of the coconut goes well with the malt, and it’s surprisingly light on the palate,” Price says. “It goes great with our Pookie Pie,” which Even Stevens sources from local vegan/gluten-free bakers City Cakes. A spin on the Whoopie Pie sandwich cookie, the two dense fudgy cookies have a generous slather of buttercream in the middle. It resembles a flourless chocolate cake texture, and the buttercream is sweet and intense. 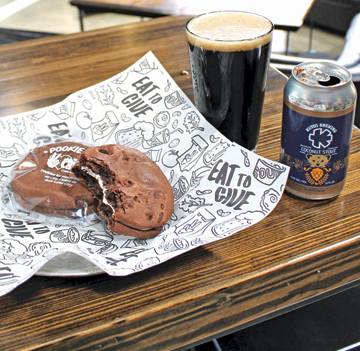 We agreed it’s a rich treat to eat all in one go, but Price says that’s the best part of pairing it with beer, especially with the coconut stout’s effervescent balance. Or even better, share both with a friend. It’s the Pie and Beer way.